Last night (and into this morning), we were present for a rather sizable event. 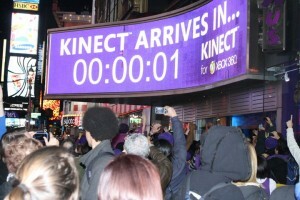 The Microsoft Kinect launched at midnight and Gamer Reaction was on the scene! After waiting outside in line for hours and hours (and in the case of the first person in line, days), the general public was allowed to walk into the Toys ‘R’ Us in Times Square and purchase a Kinect. These release day troopers didn’t wait alone, however. Not only were there about a gajillion people waiting in line, but Major Nelson was there with them all day. He greeted the line in the morning with hot coffee and fresh donuts for all! He stayed outside in the cold with them all the way up until the clock struck 12 and the doors opened. Thats pretty awesome. As stated before, Major Nelson was there and he is just about the nicest guy in the world. I was a little taken aback by it. I had to go punch somebody just to balance out the universe. Cliffy B, from Epic Games, was also on hand for a good portion of the event. 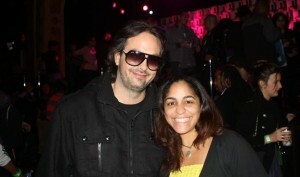 However, the big star of the night was Kudo Tsunoda, creative director for the Kinect. He showed up close to midnight and stayed for the after party. The after party was at the Hard Rock Cafe across the street. The first 300 people to buy the Kinect were invited, as well as some press and obviously all the Xbox people. The party was awesome. There was tons of free food, an open bar, multiple Kinects set up with different games for people to play, a live DJ, and an open bar. Yeah. Dianna and I finally tagged out at about 3am and each headed home. Oh, and we got a few t-shirts for you guys too. All in all, the Kinect launch was a huge success and everybody seemed to have a great time. Way to go, Microsoft. You know how to throw a launch. I was directed to this site by a good friend of mine who you met this past Wednesday night, Jackal. Interesting article, it was a cool read. Is there anywhere on the site with more pictures of the event? Also, i couldnt find a forum. I would have loved to mingle with the community you have but i cant seem to find where everyone would gather. Well, keep up the good work.